Written by Travel Excellence Best companies of the year assisted the most important night at the firm level at the Ramada Herradura Hotel, one of the 5 stars hotels in Costa Rica. The Chamber of Commerce rewarded the effort, dedication, and commitment of the companies and business professionals through its Awards Night. There was a remarkable assistance of about 400 people and were hand out 15 awards and 2 special awards given to those Costa Rican individuals and companies that excelled in the quality and productivity the country needs. This year, the small and medium enterprises were rewarded by the Chamber of Commerce in several categories; this to obtain recognition for their merits and so they could compete on equal opportunities. For the “Trade” award, winners were “Casa Blanca” and “Altea Design” (SME’s category). Silvio Lacayo Lacayo was the winner for “entrepreneur of the year”. This award is given to the owner or stake president, who has stand out for his leadership and ethics. Mario Rivera was noted for his business management in the service, industry and marketing area. Thanks to this he won the award for “manager of the year”. For successfully implementing innovative business practices and developing an innovative product or service, the Florex Company (SME’s category) won the “Innovation” Award along with Costa Rican Medical Holding. He dedicated a minimum of 10 years on providing successfully a service encouraging a company commercial development in the country. This man is the winner of the “Liberal Professional of the year”, Diego Salto Vaan der Lat. This award recognizes the women’s growth. The winner for the “Women and Business” award was Lyda Feoli Luconi. The winner for “Corporate Social Responsibility” award is Taller Costa Rica Enderezado y Pintura (SME’s category) and Banco Bac San José for implementing voluntary initiatives to conduct their business responsibly. 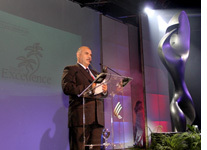 “FEDECÁMARAS” award is a special award given by the National Federation of Chambers of Commerce and Business Associations of Costa Rica to an associated camera that has distinguished during its membership. The winner is Cámara de Comercio de Cartago. “Travel Excellence S.A.” (SME’s) and Aerocasillas were awarded with the “Services” award for projecting a strong growth in the marketing of intangible products. “Responsible Environmental Management” award is given to the company that stands by implementing business policies friendly to the environment. The winners for this award were Funde Llantas (SME’s category) and Florida Ice and Farm. Costa Rica history is growing, through successful facts as these. Lots of people are decided to come to know the growth and beauty of this country in a last minute travel deals to Costa Rica.